Author: Marion R. Miller, B.A.T. Ellen White’s view of the Shaking of Hebrews 12 is quite nuanced. However, as one searches her writings a central theme seems to emerge: those who pray, confess their sins, and surrender their lives completely to God will not be shaken. On the other hand, those who are just following God for convenience sake but who are inwardly serving themselves will be shaken. Whenever I read Ellen White’s writings, I always endeavor to see where I can find Biblical support for her ideas. In regards to the Shaking, I found Biblical principles throughout the twelfth chapter of Hebrews that validate her comments. Even though I had studied the topic of the Shaking before, I discovered a new layer of meaning in Hebrews 12 when I compared the chapter to her writings. In contemporary Adventism many often ridicule the writings of Ellen White, especially in regards to the health reform message. In fact, during one particular course at the Andrews University Theological Seminary, one student commented to me in the hallway, “I should have written the health message.” This person mentioned several aspects of their life in which they loved to indulge in unhealthful practices. Their comments reminded me of what Ellen White mentioned in relation to the Korah confederacy. In my research I was at first surprised to find that Ellen White implicates rebellion against health reform as a contributing factor to the Shaking. However, as I began to ponder all of these quotes, I began to formulate what I term the “Esau Principle”. Esau’s selling of the birthright for a bowl of lentils did not happen overnight. His compromise was a result of the indulgence of appetite over the course of many years. This course of selfish indulgence affected his mind in such a way that he no longer saw the birthright as a blessing but as something that kept him from getting what he wanted. I believe that many in Adventism are committing the same mistake when they belittle the health reform message and live their lives in open defiance against the health principles that God has revealed to them. As with Esau, many will compromise their spiritual birthright when the time comes to choose between God and being able to buy and sell. However, God always gives a warning in order to help us turn from our ways. I have not always appreciated the health message as I should. Due to this short research project, I have decided that I should appreciate health principles more than I do now. I know as I follow God’s will for my health, that it will help my mind to become clearer and thereby strengthen my spiritual walk with Christ. My methodology started with the Bible text in Hebrews 12:27. Next I searched the writings of Ellen White for the term “the Shaking”. I found several interesting quotes. I then searched the term “straight testimony”. This term came to view as I read Ellen White’s comment in Testimonies to the Church Volume 1, p. 181. I also saw that the terms “straight testimony” and “plain testimony” were used interchangeably in her writings. So I did a further search using the term “plain testimony”. After finding that health reform is tied to the “straight testimony” I then compared Ellen White’s writings to Hebrews 12. I noticed that Hebrews 12 mentions Esau in the general context of the Shaking, so I did a further search on Esau. I also found that Ellen White links Korah to the straight testimony and health reform. Throughout my research time, I compared Hebrews 12 with the statements by Ellen White to see possible correlations. If I had to do anything differently, I would simply take more time to further develop this topic. Ideally I would like to explore the historical context of Ellen White’s statements and see if they shed further depth on this issue. The following are my humble findings. I have added emphasis to Ellen White’s comments by italicizing the quotes. This was done in an endeavor to draw out the principles that I believed related to the Shaking. I have also added explanatory notes and comments where I have compared what Ellen White has stated with the account of the Shaking in Hebrews 12 as well as other pertinent Bible passage. “I asked the meaning of the shaking I had seen, and was shown that it would be caused by the straight testimony called forth by the counsel of the True Witness to the Laodiceans. This will have its effect upon the heart of the receiver, and will lead him to exalt the standard and pour forth the straight truth. Some will not bear this straight testimony. They will rise up against it, and this will cause a shaking among God’s people.”—Testimonies For The Church Volume 1, p. 181. “We are in the shaking time, the time when everything that can be shaken will be shaken. The Lord will not excuse those who know the truth if they do not in word and deed obey His commands.”—Testimonies for the Church Volume 6, p. 332. Jesus, the True Witness, mentions in Matthew 7:24-26 that those who hear His Words and do not put them into practice will be like the man who built his house on the sand. The storm came and beat on that house and it fell. Likewise, as Mrs. White indicates, if we know the truth and do not “in word and deed” obey His commands, we will be shaken. “The Lord calls for a renewal of the straight testimony borne in years past. He calls for a renewal of spiritual life. The spiritual energies of His people have long been torpid, but there is to be a resurrection from apparent death. By prayer and confession of sin we must clear the King’s highway.”—Testimonies for the Church Volume 8, p. 297. Comment: Part of the straight testimony is a call for a renewal of spiritual life. It is also a call for prayer and confession of sin. This brings into perspective the renewed calls of the General Conference for revival and reformation. “One night I was awakened and instructed to write a straight testimony regarding the work of our school at Loma Linda. By that school a solemn and sacred work was to be done. The teachings of health reform were to stand out clearly and brightly, that all the youth in attendance might learn to practice them. All our educators should be strict health reformers. The Lord desires that genuine missionaries shall go out as pioneers from our schools. They are to be fully consecrated to the work as laborers together with God, daily enlarging their sphere of usefulness and becoming more fully sanctified through the truth. The influence of a consecrated medical missionary teacher in our schools is invaluable.”— Manuscript 31, 1908. Comment: Jesus gives the straight testimony through His leaders and teachers. Ellen White relates the straight testimony to the health reform message found in the Bible. Those who do not follow the health reform message will end up serving themselves. By implication of the previous statements, they will rise up against the message and will be shaken out. Comment: The rebellious children of Israel are embedded in Paul’s description of the Shaking in Hebrews 12. You can see this in verses 18 and onward in Hebrews 12. Why did the majority of the children of Israel rebel against God? It was because they refused to hear the “straight testimony” of God’s voice on Mt. Sinai. Instead, they would rather indulge their appetites by worshipping a golden calf and clamoring for a diet which they deemed better than God’s prescribed diet. Because of this, the majority of those who first left Egypt were shaken out in the wilderness. Comments: The use of the words “plain testimony” are also used interchangeably by Ellen White with the words “straight testimony.” In other words, the case of Korah, which came about by the indulgence of appetite and the rejection of self-control, is related to the Shaking. Ellen White notes that the same attitude of those who united with Korah would war, scatter, and sow discord among God’s people in the last days. This helps to verify that the unconverted professed Adventists are the ones who cause a shaking among God’s people. They are the ones who cause discord and a scattering of God’s people in the last days. It is interesting to note that the case of Korah is also alluded to in Hebrews chapter 12 and verses 25 and 29. Compare with Numbers 16, especially the consuming fire of verse 35. The spirit of Korah will also be directed against the straight testimonies. This would, by extension, include trying to make the writings of Ellen White appear to be untrue. “There is need of a great reformation in our ranks. The ministers who are drawing pay from the conference need to ask themselves the question “Am I a faithful worker? Am I a spiritual help to the church?” There are those who demand high wages for their labors, but who bring few souls into the truth to stand steadfast and true to its principles. It is time for our ministers to humble their hearts before the Lord, and bear a straight, convincing testimony to the people. It is time for them to labor earnestly to increase the membership of the churches, leading all to a thorough understanding of the truth for this time. The Lord wants living members in His church, men and women who will encourage one another in faithful service.”—Manuscript Releases 9:115. “Just as soon as the people of God are sealed in their foreheads—it is not any seal or mark that can be seen, but a settling into the truth, both intellectually and spiritually, so they cannot be moved—just as soon as God’s people are sealed and prepared for the shaking, it will come. Indeed, it has begun already; the judgments of God are now upon the land, to give us warning, that we may know what is coming.” (Manuscript 173, 1902). “The time is not far distant when the test will come to every soul. The mark of the beast will be urged upon us. Those who have step by step yielded to worldly demands and conformed to worldly customs will not find it a hard matter to yield to the powers that be, rather than subject themselves to derision, insult, threatened imprisonment, and death. The contest is between the commandments of God and the commandments of men. In this time the gold will be separated from the dross in the church.”—Testimonies for the Church 5:81 (1882). “The great issue so near at hand [enforcement of Sunday laws] will weed out those whom God has not appointed and He will have a pure, true, sanctified ministry prepared for the latter rain.”—Selected Messages 3:385 (1886). Comment: In the last days God will again shake the earth. The first shaking was when Jesus gave the Ten Commandments. (Hebrews 12:18-27) In fact, the experience on Mount Sinai was so dreadful that even Moses was trembling. (Hebrews 12:21) In the last days, the issue will again be in the context of Jesus making His commandments prominent. (Revelation 12:17; 14:12) We will either choose to love Jesus supremely and allow His law to be written in our hearts or we will choose to sacrifice our relationship with Jesus for the temporary safety that the beast power offers. Also, according to Revelation 13, in the last days God’s people will not be able to buy or sell. Many Adventists will “sell out” like Esau did, in order to provide food and provisions for themselves or for their family. 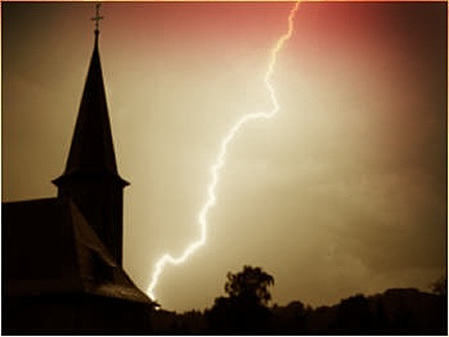 “The church may appear as about to fall, but it does not fall. It remains, while the sinners in Zion will be sifted out—the chaff separated from the precious wheat. This is a terrible ordeal, but nevertheless it must take place.”—Selected Messages 2:380 (1886). “The Lord has faithful servants who in the shaking, testing time will be disclosed to view. There are precious ones now hidden who have not bowed the knee to Baal. They have not had the light which has been shining in a concentrated blaze upon you. But it may be under a rough and uninviting exterior the pure brightness of a genuine Christian character will be revealed. In the daytime we look toward heaven but do not see the stars. They are there, fixed in the firmament, but the eye cannot distinguish them. In the night we behold their genuine luster.”—Testimonies for the Church Volume 5, pp. 80, 81. The Shaking actually happens when those who do not want to bear it, rise up against it. As in the case of Korah, they form alliances and endeavor to rebel against those who are bearing the straight testimony. Those who rebel against the straight testimony do so because Adventism becomes unpopular. The Shaking is precipitated by Sunday Laws being passed due to the judgments of God hitting the world. Those who rise up against the straight testimony have to choose between God and their everyday provisions. Many, like Esau, will sell their spiritual birthright for food and provisions. Those who did not plead and agonize for salvation leave and go out into darkness. However, those who have been shaken out will be replaced by new converts who take hold of the truth. Daily billions of people drink tea and coffee, and a Google search reveals many health benefits of moderate use. In longevity studies, called Blue Zones, tea drinking is a factor in long life. A cup of coffee is not sin, it is not the “straight testimony,” it is just a herbal drink with some natural properties that support mental and physical alertness. Sin is transgressing the Law, and EGW declared that the laws of health are equal to the law of God in which there is some truth this. Yet her applications are often erroneous and create a completely new category of sins as well as a new religion—called Food Religion. Especially since Paul teaches that, there the only one sin we do against our body that is sexual immorality, not the eating of food (1 Cor 6). I agreed with a lot of what you said until this little gem. I’m sorry, but if you transgress the Biblical health laws found in Leviticus then you do indeed sin. “They that sanctify themselves, and purify themselves in the gardens behind one tree in the midst, eating swine’s flesh, and the abomination, and the mouse, shall be consumed together, saith the LORD” (Isaiah 66:17). It’s not just fornication that destroys the body temple. It’s the unclean food that we put into it. It is also bad music, television, movies, etc. Don’t let your desire for food overcome your desire to please God. “The controlling power of appetite will prove the ruin of thousands, when, if they had conquered on this point, they would have had moral power to gain victory over every other temptation of Satan. But those who are slaves to appetite will fail in perfecting Christian character.” 3T pp 491-492. The main reason for the health message is not just so we can live longer on this earth, its main purpose was to bring discipline into our lives so the power of temptation can be broken and we can be over comers instead of those the are over come and eternally lost.